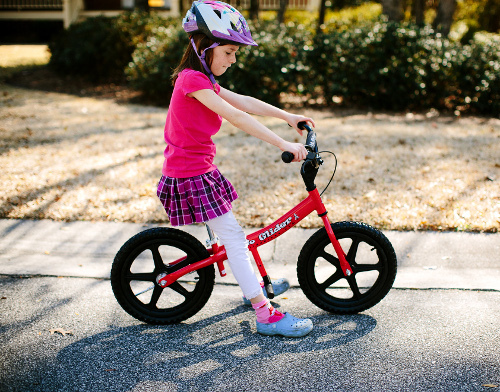 News :: Outside in the Summer - Glide Bikes - Balance Bikes for 18 months to 10 years old! It’s May, and that means that the school year is winding down. As Healthy Kids day reminded us, kids are often exposed to less opportunities for exercise or outdoor activities during the summer when school is not in session. School allows children access to other kids and social situations that can easily lead to group activities where physical exertion is involved. Recess, extra-curricular activities and physical education classes all contribute to outlets for kids to get that heart rate up and let off some steam. Sometimes it can be difficult to ensure that your kids get the same sort of scheduled and consistent outdoor activity at home as they are exposed to throughout the school year. Making sure your kids have access and are reminded about fun and engaging ways to spend time moving can make the summers more productive and enriching for your kids. Whether it is learning how to balance on their very first Glide Bikes balance bike, taking a traditional two wheel bike and strolling through the neighborhood, shooting some hoop, roller skating, or playing a quick game of tag with other kids, providing and informing your children of these opportunities is an important part of their summer experience. So this summer make getting outside, and moving around an important part of your family’s summer experience.